East Valley Life: Fab Fabric! My kitchen is a mix of unusual colors. We inherited the soft yellow and country blue wallpaper from the previous owner. We painted the wall beneath the chair rail in the same country blue. The wallpaper has tiny pink/lavender flowers on it, so we continued the color of the livingroom (Still Shores by Behr) into the other walls of the kitchen to match the flowers. I like it - but it's impossible to find any coordinating fabric. Or so I thought until I found this on eBay. . .
All the colors of my kitchen AND it has teapots, fruit and flowers on it. I bought the fabric and begged the seller for more. She had it! So, today I took down my old blue curtains (left) and made some snazzy new curtains (right). 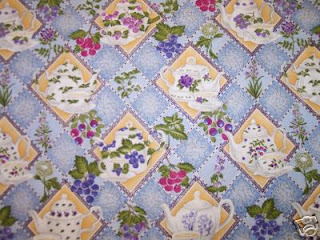 I purchased enough of the fabric to make myself an apron, but then I found Roses and Tea Cups who sell pinafore aprons made with the exact same fabric. I can't wait to get my apron from them. Now I am going to use my remaining fabric to make covers for my Kitchenaid mixer and my toaster oven. It's going to be a busy week!